Two minutes one night, 22 minutes the next. 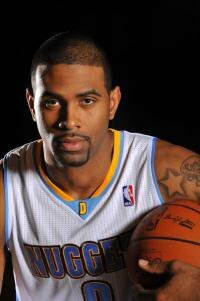 Denver Nuggets rookie Gary Forbeshas literally been battling for playing time all year long. Despite not logging the most consistent minutes, the UMass grad has made the most of what time Coach George Karl has given him. Averaging 4.9 points in 12 minutes per game, including eight outbursts of 10 or more points and a career-high 19-point outing against New York earlier this season, Forbes is ready. After a recent practice, we got the chance to hop on the phone with Forbes to talk about life in the Mile-High City after ’Melo, his journey to the NBA and more. Dime: Let’s just get this out of the way. How do you feel about the Carmelo trade? Gary Forbes: It’s tough because Carmelo has become a good friend of mine, but it is what it is. That was my dude and everything so it’s definitely a different team around here, but it’s what he wanted to pursue, so it was just time for both parties to move on. Dime: How’s the rest of the team been taking it? GF: Everyone is doing good so far. We’ve been winning games since the trade and wins always help everything. Dime: Obviously ’Melo, Chauncey and Anthony Carter were huge locker room leaders. Has anyone stepped up since the trade to fill that leadership presence? GF: K-Mart is a veteran guy so he’s always been vocal, but even more so now. Al Harrington is another veteran guy who’s stepped up too. The team has played some good games too and guys have been playing their roles and doing the right thing, so there hasn’t been too much downfall from that standpoint. Dime: What has Coach Karl told you your new role on the team is moving forward? GF: He told me he’s going to be tough on me because a lot of the new guys play the same positions as me. I’m just going to stay committed, stay focused, and when I do get in the game to just keep playing as hard as possible and keep doing what I’ve been doing all season long. Dime: Thoughts on the new players coming in? GF: They’re all great. It’s exciting. We got a good group of basketball players and they’ve been in an up-and-down system before, so they’ll be able to play the same here as they played in New York. We’re expecting great things from them. Dime: You’ve had a long road to the NBA which includes two colleges, playing FIBA ball and overseas experience. What has that road been like? GF: Well, I’ve never really had anything given to me, and with politics not always being on my side, I’ve always been a fighter. The long road was nothing new for me. I’m just glad I finally accomplished my dream of getting into the NBA. I’m just here to play well and keep living out my dream and fight to get better. And one of these days, I’ll have my spot like I’ve done in high school and college. I’ve always been a late bloomer, so as long as I’m here, I’m happy. Dime: Now for some off the court stuff. Who’s got the most tattoos on the team? GF: Hands down J.R. definitely gets that top spot. Birdman comes in with a close second though. Dime: You tweet out #BlueAndYellow a lot, which is an obvious play on Wiz Khalifa’s “Black and Yellow” song. Who else is playing in the locker room these days? GF: A lot of Lil Wayne, 50 Cent, Jay-Z and whatever’s hot right now. Obviously Wiz Khalifa too. I’m the music guy on the team, so you’ll always find my iPod connected to the speakers in the locker room. Dime: The vets let you control the iPod? GF: Yeah, they let me control it. I had a great showing of my music collection when I first got here, so I think they were impressed and they’ve just left it up to me since. Dime: As a rookie, what type of hazing stuff have they made you do? GF: The only things I’ve had to do has really been like carrying a bag or two here or there, and starting a car if it’s cold outside. Nothing extreme. Dime: We’ve seen your Denver Nuggets rookie blog. How did that come about? GF: The team wanted me to do something so fans can interact and keep up with me besides my Twitter page. On the blog I just let the Nuggets fans know what I do on the road, how my year has been, how I made the team, and stuff like that. Dime: What did you do for All-Star Weekend? GF: I went home to Brooklyn. I went to my old high school (Benjamin Banneker Academy) and I got to talk to the team before one of their big playoff games. Besides that, it just felt good being home relaxing with family and friends. Dime: Speaking of schools, as a fellow UMass alum, I have to ask you when UMass is going to make it to the NCAA tourney again. GF: I have no idea man. They’ve had a few down years since I’ve left, but Coach Kellogg has that team playing hard and it’s a real good group of talented young kids. Dime: I know we still have the rest of the year to play, but do you have any summer plans yet? GF: I definitely hope I get re-signed with Denver or at least picked up by another team who’s willing to give me an opportunity to continue my dream. As far as work outs, I’m going to be all over the place this summer training in Vegas, Florida, New York and Baltimore. We also have the FIBA games coming up in Argentina and I’ll definitely be taking part in that with the Panamanian National Team.